Hurricane Maria made landfall in Puerto Rico more than six months ago, devastating the island’s economy and the electrical grid. Efforts to restore full electricity service continue. As of the beginning of this week, more than 100,000 Puerto Ricans were still without power. What was already the largest blackout in American history has now likely become, in our analysis, the second largest blackout in the world. Late last October, a little more than a month after Hurricane Maria hit Puerto Rico, we analyzed its impact on electricity service in Puerto Rico, as well as the US Virgin Islands, which were also devastated by the storm. At that time, power had been restored to only 26% of Puerto Rico and only 16% of the USVI, based on utility data submitted to the Department of Energy’s Office of Electricity Delivery and Energy Reliability. Using the share of generation restored as a proxy for the ratio of customers with electricity, we estimated that Hurricane Maria produced the largest blackout in US history. During the remainder of 2017, utilities in PR and the USVI made modest progress in restoring electricity service, with support from the federal government and utility crews from around the country. Yet at the start of 2018, 55% of Puerto Rico and 26% of the USVI remained without power. Utilities began reporting the number of customers for whom service had been restored directly, as well as the percentage of pre-storm power generation restored. Full service was restored in the USVI in February, according to DOE data. As of the start of this week, power was back on for 96% of Puerto Rico, with 53,000 customers still in the dark. A “customer” is a household, which means between 100,000 and 200,000 Puerto Rican residents still lack electricity service. In our October analysis, we compared blackouts based on the cumulative lost customer-hours of service. 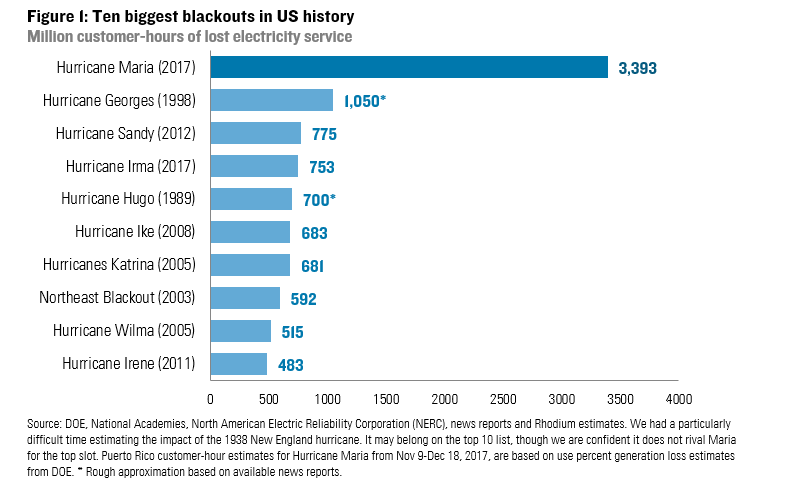 Using that metric, Hurricane Maria surpassed all other US blackouts in recorded history by causing over 1.2 billion lost customer-hours a little more than a month after the storm hit. As of the beginning of this week, that number has grown to 3.4 billion. That makes Maria three times larger than the next biggest blackout in US history (Figure 1). In fact, more customer-hours have been lost in Puerto Rico due to Hurricane Maria than in the rest of the US over the past five years due to all causes combined. Some really big blackouts have occurred outside the US. In 2012, for instance, two big, back-to-back blackouts impacted hundreds of millions of people in India. However, the duration of the events were relatively short, resulting in a cumulative 2.5 billion lost customer-hours of service in our analysis (Figure 2). Tropical Cyclone Sidr knocked out power for 75 million people in Bangladesh in 2007, but electricity service was restored much more quickly than it has been in Puerto Rico and the USVI. As a result, cumulative lost customer-hours of service totaled less than half that from Hurricane Maria. We found only two blackouts that rival Hurricane Maria and both were in the Philippines. We estimate that Typhoon Bopha disrupted 3.2 billion customer hours across the country in 2012. The next year, disaster hit the Philippines again. Typhoon Haiyan disrupted 6.1 billion customer hours, making it the largest global blackout we could identify in our research. 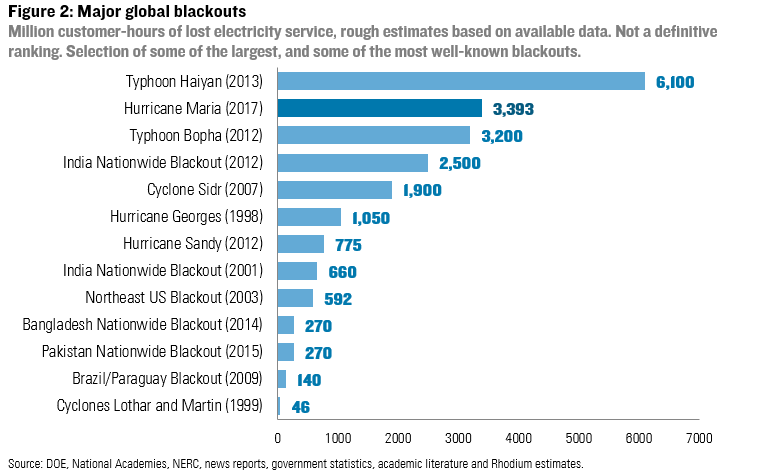 Given the data limitations, it is certainly possible there are other large, non-war-related blackouts we missed but based on available information Maria now ranks as the second largest blackout in recorded history. An important caveat here is that our analysis only covers areas with power that lose it due to storms, infrastructure failures or other kinds of service disruptions. According to the International Energy Agency, there are still 1.1 billion people around the world who have never had electricity to begin with. While that is fewer than the 1.7 billion people without power in 2000, electrifying these communities remains one of the most pressing economic and human development challenges. However, making existing electricity supply more resilient to storm-related disruptions in both developed and developing countries is also important, particularly given recent and projected changes in the global climate. Editor’s Note: The original version of this note incorrectly labeled Hurricane Georges in Figure 2 as occurring in 2008. We corrected Figure 2 to reflect the correct date, 1998.